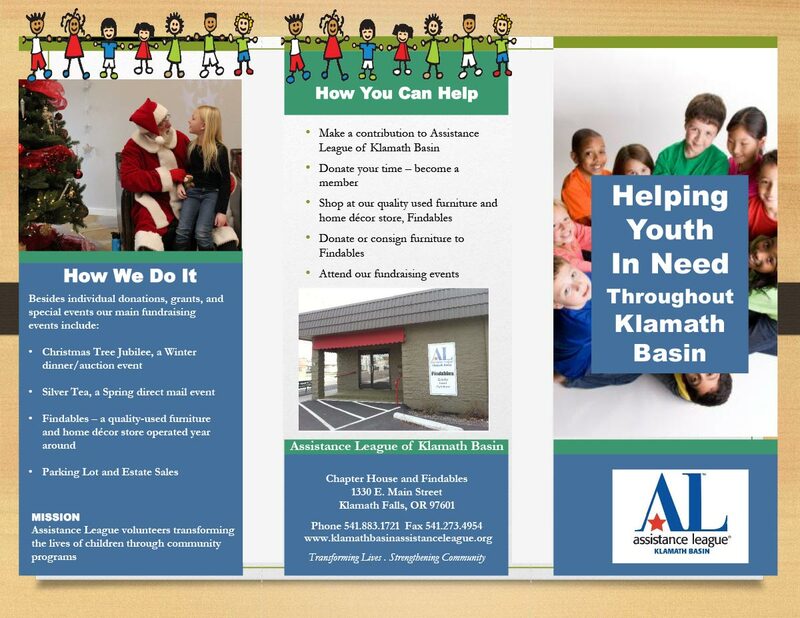 Assistance League of Klamath Basin is a nonprofit, nonpolitical, nonsectarian IRS 501(c)(3) charitable organization. The Fiscal Year for our chapter runs from June 1 – May 31. Funding for our program is raised through donations, grants, estate sales, Findables (our used furniture store), and special events, such as the Christmas Tree Jubilee and Silver Tea. Between 68%-71% of the funds we receive goes directly to our philanthropic programs; the rest to the upkeep of our Chapter House, support for events, and supplies. We have no-paid staff. Click for the Brochure in PDF format.